We develop Automation Workshop as a free software for our community. We communicate with our users and try best to meet their needs. We are currently considering developing a message board, if sufficient number of users will request it. Let us know if you think a forum would prove useful to you. 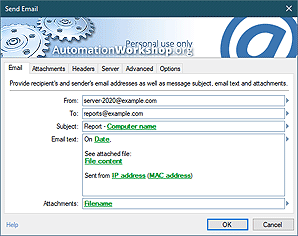 Automation Workshop Free Edition is a Windows automation software made by Febooti Software. At Febooti Software, we believe in free software. And although we earn our living by selling software, we have decided to offer Automation Workshop to home users completely free of charge. Note, though, that Free Edition is for non-commercial use only. See License Agreement to see conditions of free use. Otherwise there are no caveats, feel free to download your copy and automate your IT processes! However, we would like to encourage you to help us in continuing the development of Free Edition. We would appreciate passing the word on Facebook or Twitter. Your feedback is valuable to us as well, do not hesitate to submit your suggestions, feature requests or feel free to thank our developers.